A few clouds this week have kept activity in the bush going a little longer into the morning. 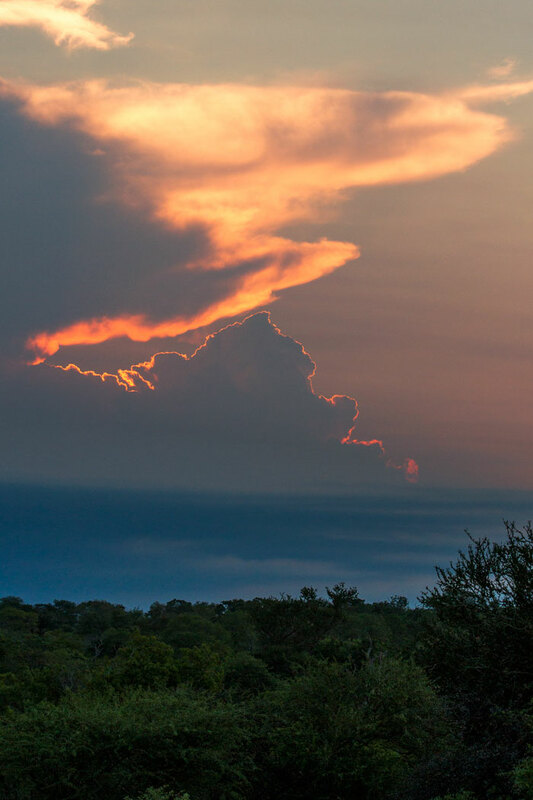 In the Lowveld Summer, it can start getting uncomfortably hot quite early on, so the lack of sun, although not quite as good for photography, can often be a welcome relief. 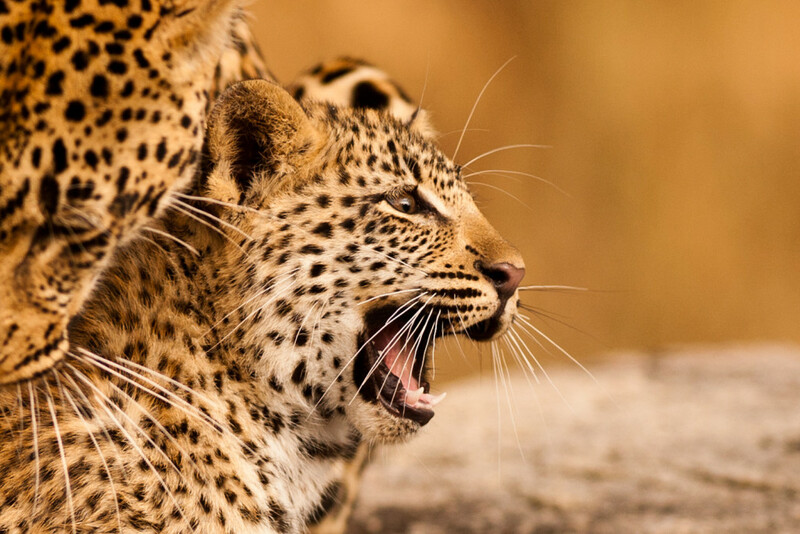 The Sparta pride gave us a scare one morning when they were found with only 3 cubs. The missing 4 were back with the pride by evening however, and are all doing well. 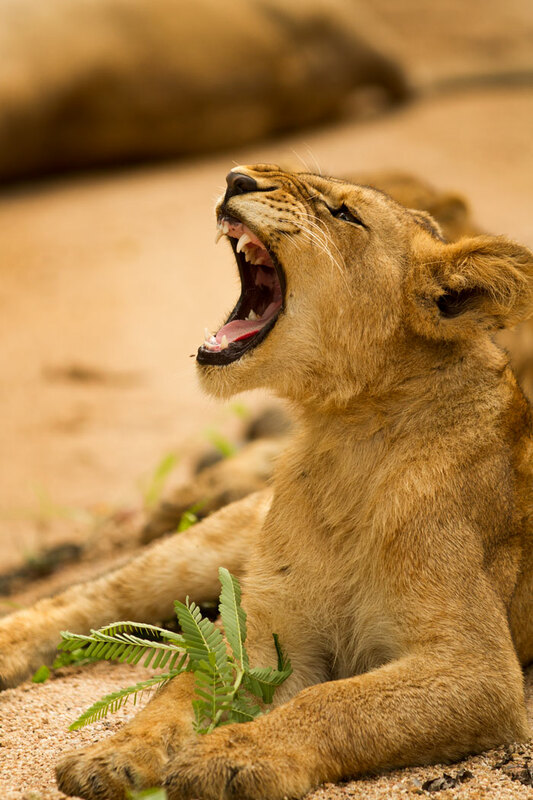 A cub from the Sparta Pride yawns in the cool shade of the Maxabene River. Two Tsalala lionesses and one of the Majingilane were found on this morning on a Zebra kill north of the Maxabene, but after examining tracks in the area, the behaviour and general temperament of the lions, as well as other bits of evidence, we believe the Sparta pride made the kill and were subsequently robbed by the bigger and stronger Tsalala females. Cloud formations with a beautiful golden lining over Sparta. One of the Ximpalapala youngsters scans the clearings on a Summer’s morning. 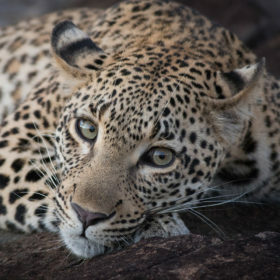 The koppie after which these leopards are named can be seen looming in the background. 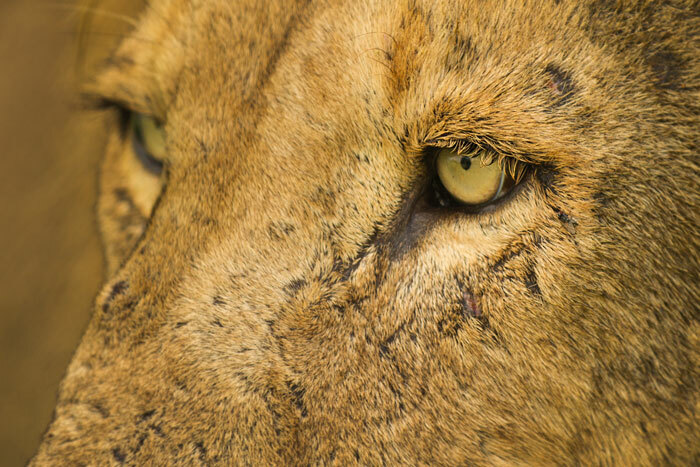 A close-up of the left eye of the Hip-Scar Majingilane. 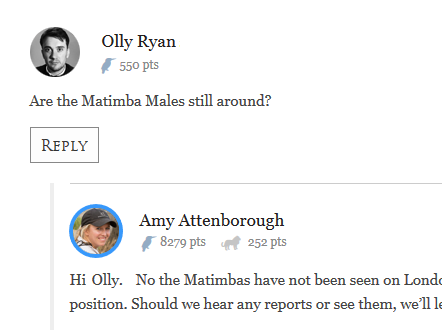 He is my favourite of the four coalition-mates. His richer and darker coat coloration, allied with his striking yellow eyes, give him an aesthetic beauty that the other three cannot match, at least in my opinion. 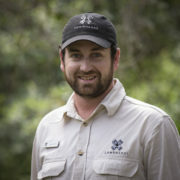 Londolozi, and the Blog Team in particular, bids a sad farewell this month to Adam Bannister. Here he is seen doing what he does best; taking photographs. 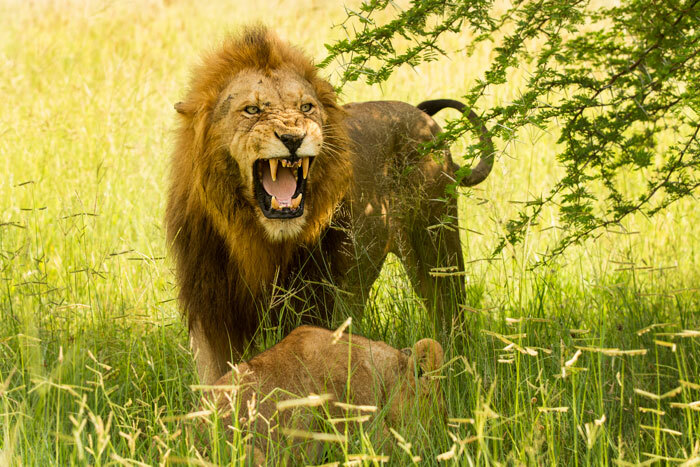 Although it seems like he has missed the lioness standing right behind him…! 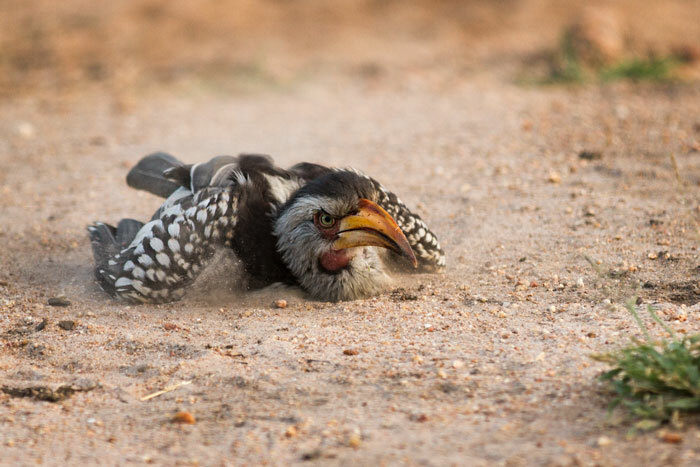 A slightly irate looking yellow-billed hornbill enjoys a dust bath in the sand overlooking the Manyelethi River. Dust-bathing fulfills a vital function for many bird species, helping them to control parasites and excess lipids in their feathers. 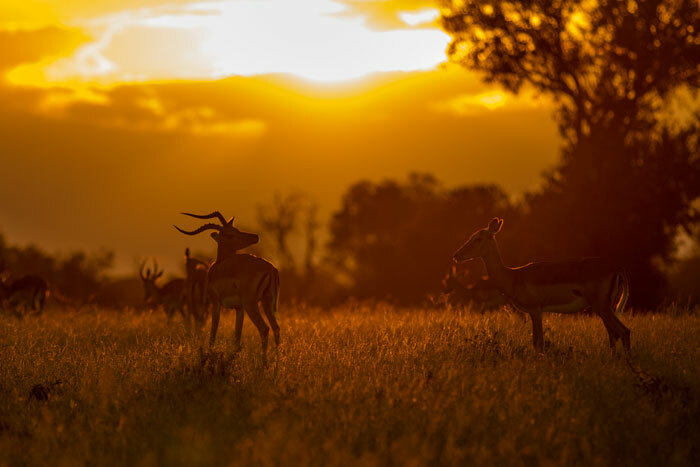 A pair of impala enjoy the sunset together on Fluffies Clearing. Their abundance at Londolozi can lead to them being taken for granted, but spending time with a herd can be a fascinating and beautiful experience. 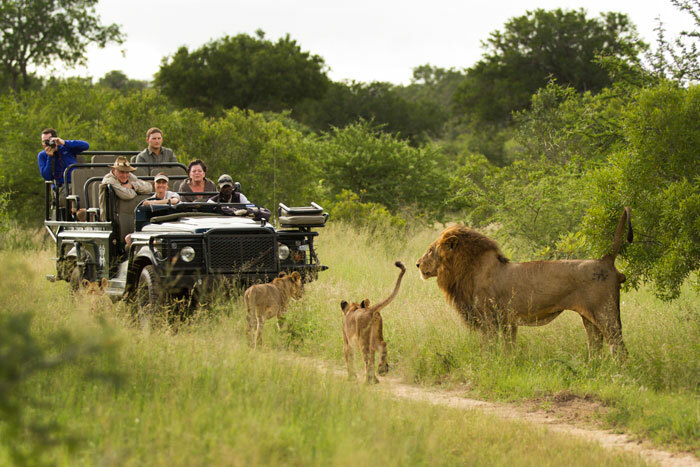 Ranger Helen Young, tracker Enoch Mkhansi and their guests have a close encounter with Hip-Scar of the Majingilane and two of the Sparta Pride cubs. 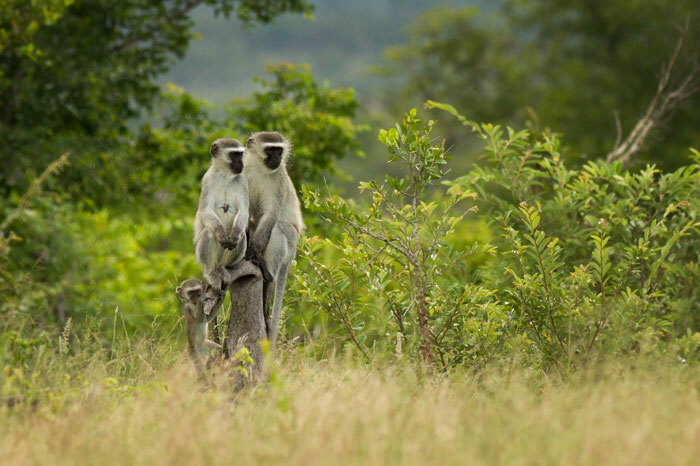 Vervet monkeys. The bane of camp managers, who have to constantly be on the lookout for these cheeky primates that are often sneaking around camp, looking to steal a free meal. 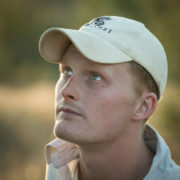 Out in the bush, however, the monkeys are fascinating animals to watch. Constantly entertaining, their antics can provide hours of wonderful viewing! An amazing caterpillar found by one of the Londolozi staff members. The Sparta pride cub with the enormous ears. 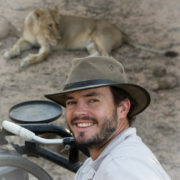 This was the same morning that we think the pride was robbed of a zebra kill by the Tsalala lionesses. The Sparta cubs and lionesses were active well into the morning’s heat; unusual for this time of year, but allowing for some fantastic photographic opportunities. 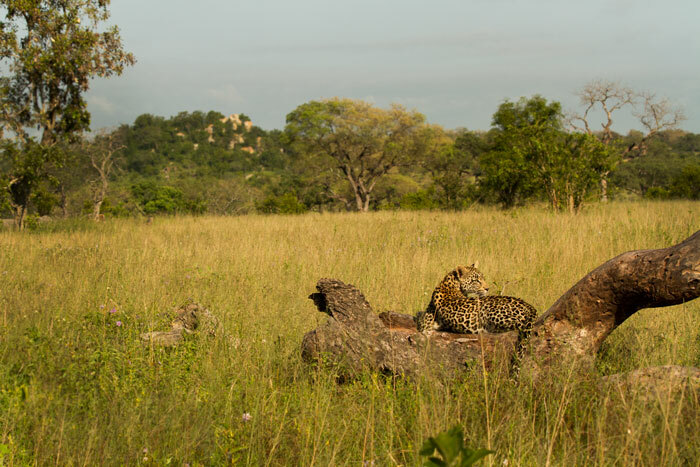 Here, the cubs had been stalking some francolins on a termite mound. A territorial white rhino bull pauses on his approach to a mud wallow to see what we are. 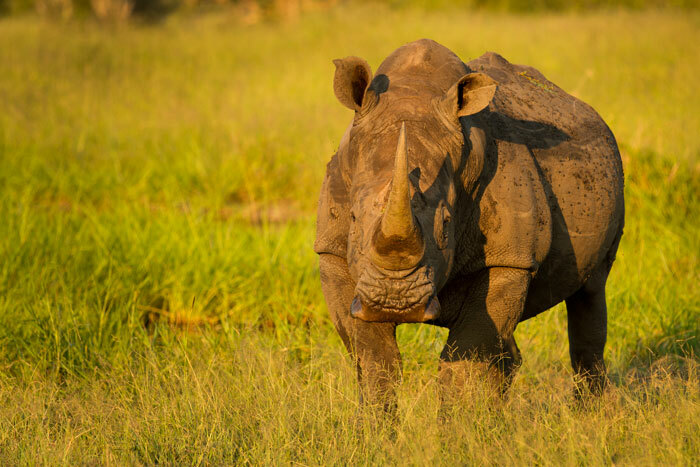 Rhinos are not blessed with great eyesight, and it is almost comical to see them sometimes as they approach a vehicle, suddenly realize it is there, snort and spin around in a puff of dust while they try and work out how this thing snuck up in them! Probably the cutest thing I’ll see for a long time. 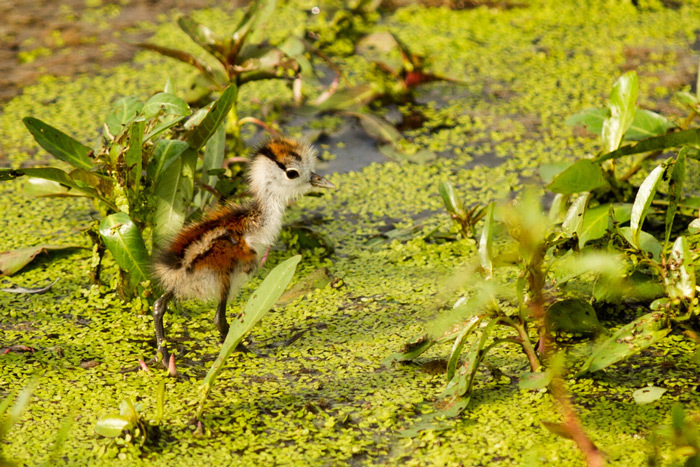 An African jacana chick scurries across the duckweed and lilies towards the safe wings of its father. 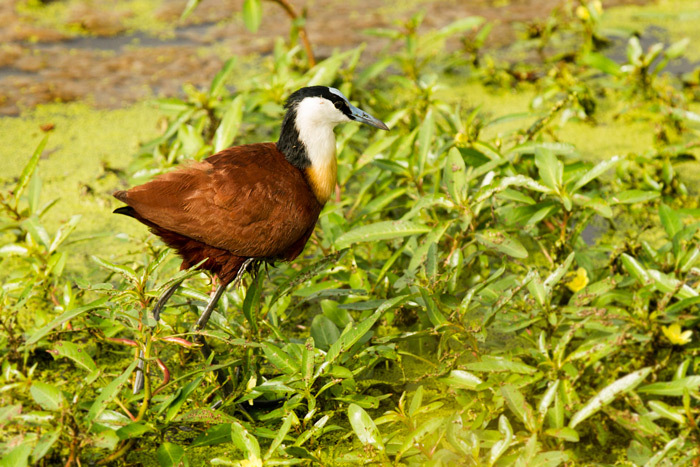 It is the male jacana that raises the chicks. If one looks closely you can see the tiny legs of the chick from the previous photo dangling from underneath the male’s right wing. 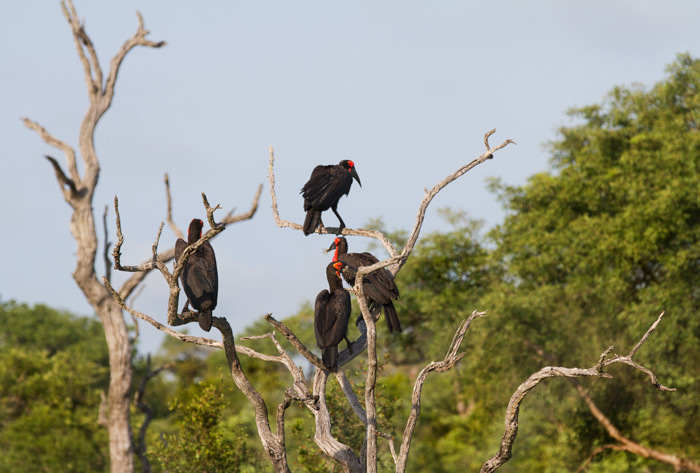 A family of ground hornbills finds a convenient perch atop a dead leadwood tree. 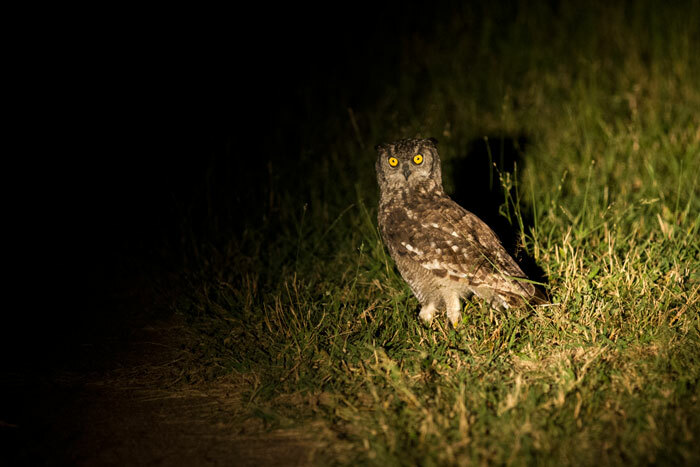 These birds are endangered but are still regularly encountered at Londolozi. 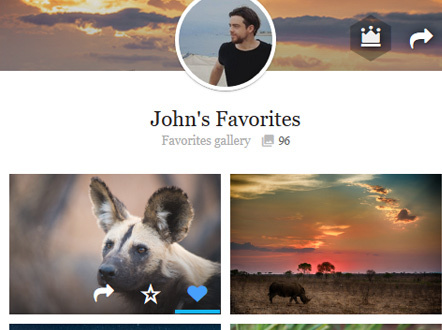 Awesome selection, especially the impala sunset shot. Quite difficult to get some good detail in the impala along wiht a good sunset. 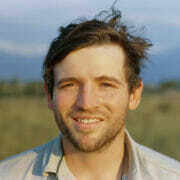 Great pictures James, love the little Sparta cub with the huge ears, so cute ! “This week in pictures”…..currently my favorite thing on the internets! Thanks for the stunning pics and weekly update. 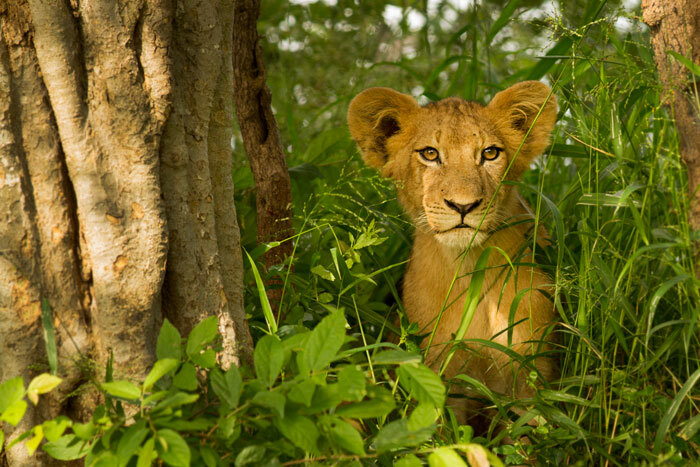 Whatever happened to the cub that had the swollen forehead – is he still around? The cub is indeed still around and doing well. The forehead swelling was a cyst which has almost completely subsided. 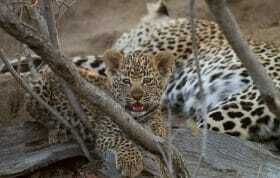 It is hard to distinguish the cub from the rest these days! Thanks for the update – I’m pleased that it was nothing serious. I’ve wondered about that cub also. Sparta Cub shot which simply glows and warms our hearts. Beautiful. 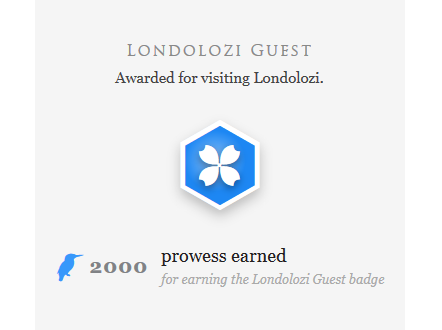 Another Friday with my sanity restored by your magnificent pictures of life in Londolozi. Next month cannot come soon enough for me. 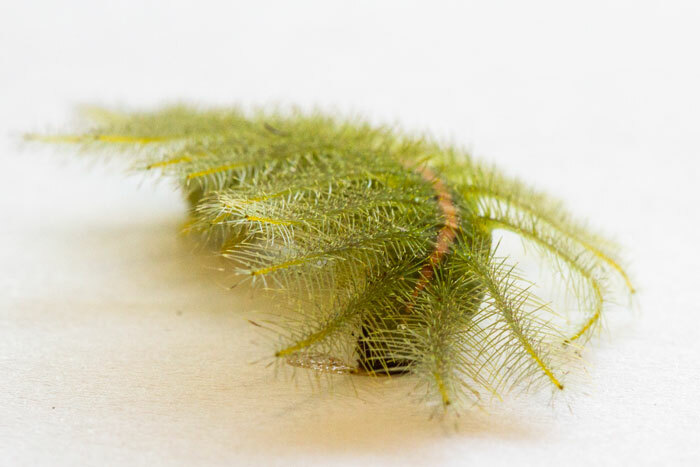 Do you know what kind of caterpillar that is that looks like a leaf? 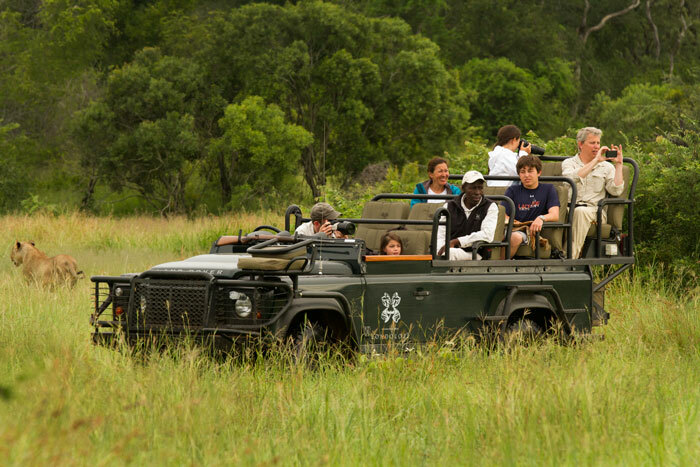 Look closely, there are THREE cubs…the third off to the left, the head just showing atop the weeds, against the jeep. But then, I’m still looking for the chicks legs under the right wing. Again, your photos never cease to amaze! 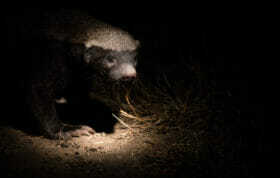 Wonderful photographs showing the great biodiversity one can experience at Londolozi! As always, my favorite, favorite way to end my Friday evenings. 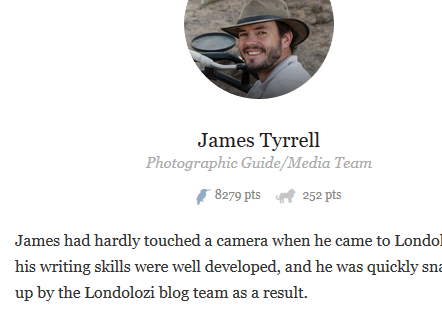 Thank you so much James. 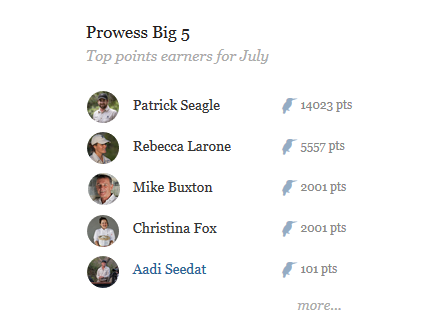 Your photographs are stunning – every one! Always a terrific way to start the day. Wonderful memories. Beautiful pictures as always. Thank you. Awesome pictures as always…Thank you!!! is the other Sub still around or has the pride lost her?? 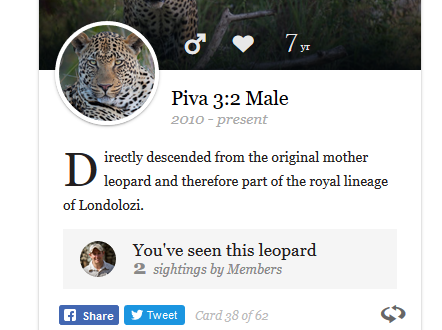 Correct, except there are two sub-adult females in the pride. 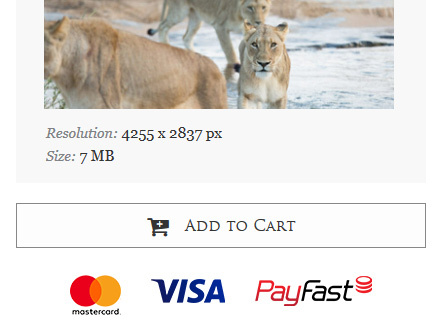 One of them is currently in very bad shape and looks like she has been mauled by another lion. 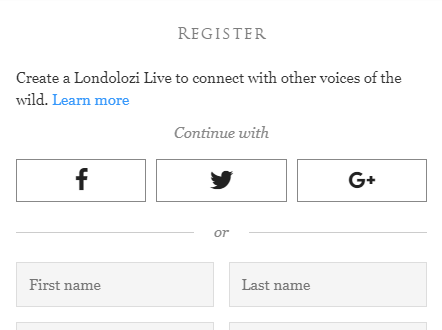 We will keep you posted.. 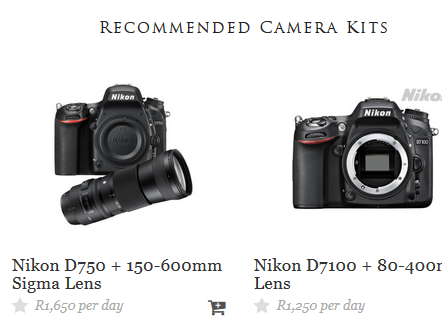 Your photographs give us so much pleasure – thank you. We were intrigued by that very odd caterpillar and wondered if you had identified it? The only vaguely similar one we could find in our Kruger Park butterfly book is Euphaedra neophron neophron, but the habitat isn’t right, so it can’t be that. Thanks again for lifting our spirits! as far as we can tell, the caterpillar is of the Euthalia genus.Euthalia aconthea is a species of which we found a matching photo, but this species is native to India and southeast Asia, and as such the one we found would have to be an alien. 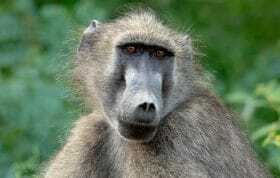 Quite possibly our version is another species in the genus. Hope you are both well!